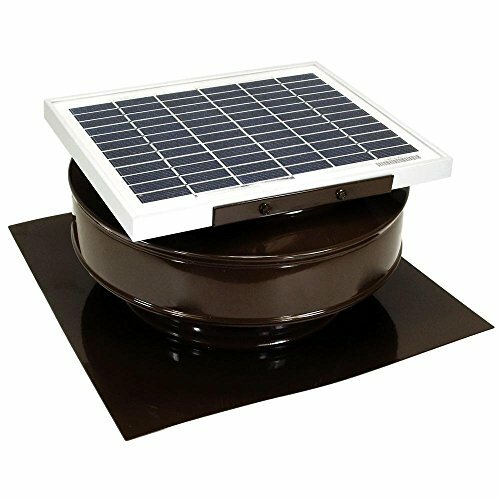 Active Ventilation Products solar powered attic fan product line, the Round Back Solar Fan, is excellent at exhausting attic spaces for shingled roofs. The solar panel provides energy to the fan on sunny days to increase the vent's CFM over and beyond a standard non-motorized static vent. The Round Back Solar Fan is made of rust free aluminum, 8 in. Dia exhaust fan with a 2 in. collar height and 13 in. x 13 in. square flange. Its low profile design looks pleasing on shingled roofs. The Round Back Solar Fan has a solid vent cap with an inner vertical louver cylinder to keep out insects, birds, and animals. The inner vertical louver allows air to exhaust without resistance. Model RBSF-8-BR is powder coated with an electrostatic charge in brown finish. The powder coating finish adheres extremely well and is more difficult to remove than wet paint which adds to the vents durability and long lasting clean appearance.